One of the Lake District's best-loved literary names has been shelved because of declining sales. The books of the late Alfred Wainwright are being taken out of print because publishers say not enough people are buying them. Wainwright guides have been in the pockets of fell walkers in Cumbria for generations. But now publishers Michael Joseph, part of the Penguin group, says it can no longer afford to keep printing Wainwright titles. Eric Robson, presenter of BBC Radio 4's Gardeners' Question Time and chairman of the Alfred Wainwright Society, says the hunt is now on for a new publisher. Wainwright, who died in 1991, wrote more than 50 books, including seven Lakeland pictorial guides, of which only a handful are left in print. He was born in Blackburn in 1907, the son of a stonemason, who left school at the age of 13. 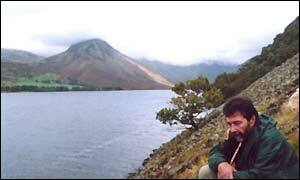 Ten years later he went on holiday to the Lake District and admitted he immediately fell in love with the area. Mr Robson said: "The publishers obviously feels the titles no longer fit their profile, but the books are too popular and too good to disappear. "They are not just guide books, but works of philosophy, explaining among other things Man's impact on the landscape. "There are scores of glossy guides to the Lakes, but not one has come close to Wainwright in terms of beauty, simplicity and elegance of presentation." Wainwright's books were first published by the Westmorland Gazette. In 1985 Wainwright books sold more than a million copies. "Wainwright's books were more than just guides"